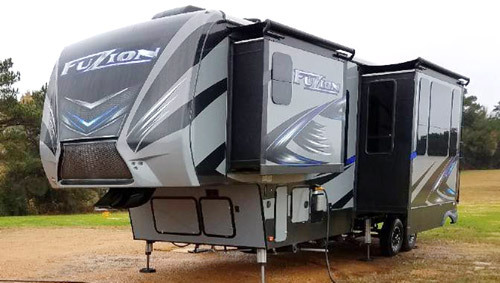 Fusion 325 Toy Hauler is lightest and smallest from Keystone’s premium fifth wheels, but it provides the best Cargo Capacity -to-GVWR ratio in the series…. 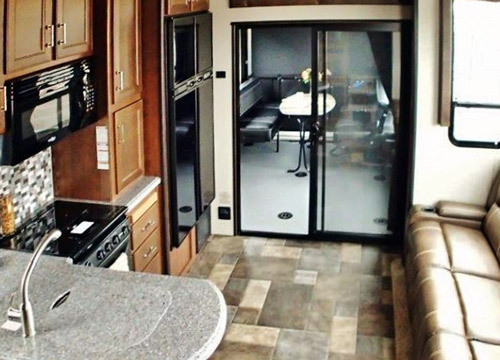 Keystone RV founded by Cole Davis started operations in 1996 and today, after just 20 years in business it is one of the leading companies in the RV industry. 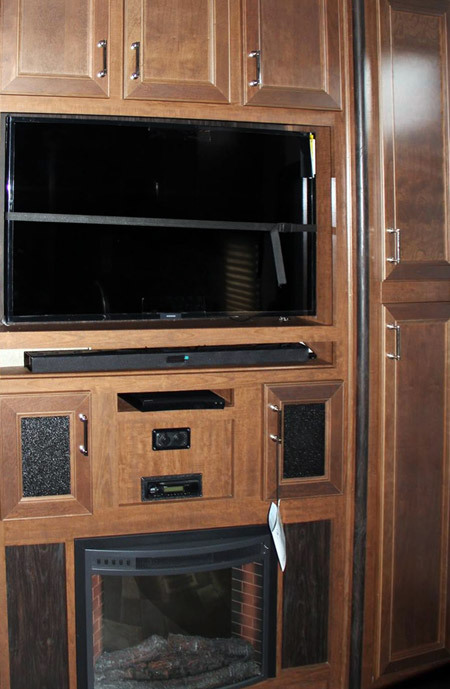 They manufacture numerous series of Travel Trailers, Fifth Wheels, Toy Haulers and Destination Trailers. 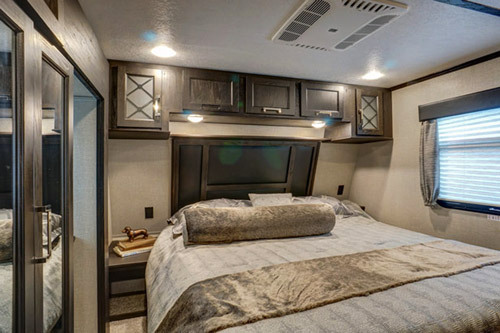 Out of six Keystone-made series of Toy Haulers (fifth wheels and trailers) two, correspondingly Fusion and Raptor represent the class of Premium Models. Given the fact that these two series offer more than 30 floor-plans it was not easy to choose just one for this 2017 presentation. Obviously the choice is always a matter of personal preferences and needs. Selecting the Fusion 325 we gave priority to the highest ratio of Cargo-to-GVWR. 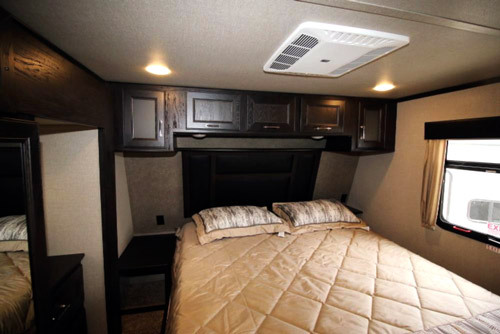 The reason is that Toy Haulers not only have to provide comfortable Living Conditions (sleeping, cooking and relaxing). 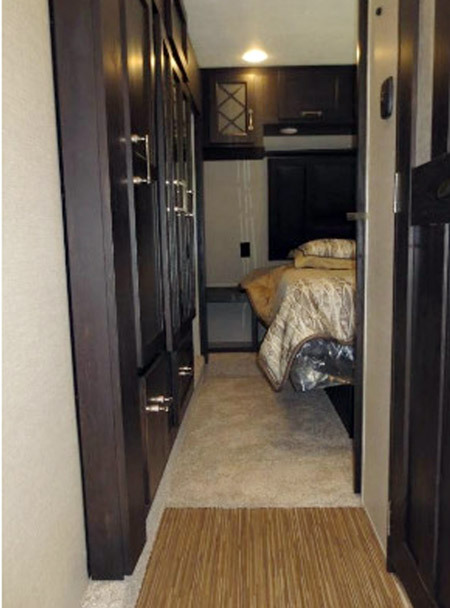 While similarly to travel trailers, higher-end toy haulers should offer familiar environment of “home-away-from-home” it’s clear that it must be the “Home with Garage”. In other words the top Toy Hauler should have ability (garage space and load) to meet your needs (obviously this is just one of many possible criteria). Just to make it clear: in the Fusion series the ratio Cargo/GVWR ranges from 0.247 (Fusion 325) with next closest models reaching 0.227 (Fusion 413 & 416) to lowest 0.174 (for Fusion 420). 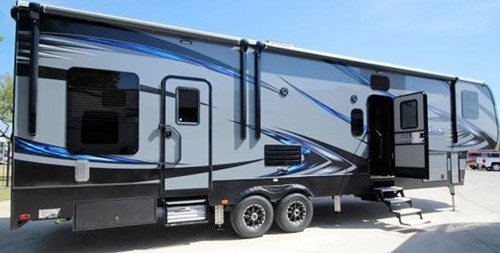 The model 325 is the lightest and smallest from the series of Fusion Fifth Wheels (FW). Of course it’s all relative – the absolute numbers with Dry Weight of 12,806 pounds and Length of 38’3” by all accounts make the Fusion 325 an impressive rig. It will still require a powerful, Heavy Duty truck to safely hit the road, but the good news is that it will allow you to carry more toys than you may find in your garage…..
Like most toy-haulers the Fusion 325 offers the flor-plan with front Master Bedroom and bathroom, central kitchen integrated with living area and a rear garage. It has two slide-out extensions (bedroom’s wardrobe and living room lunge (reclining-sofa) as well as 2 side entrance doors (and rear ramp door). 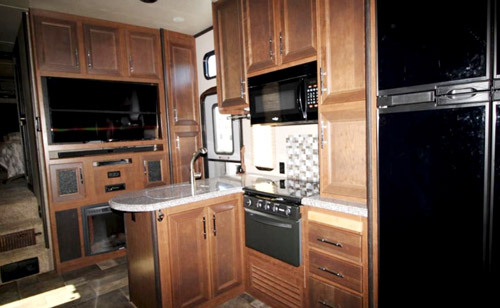 As mentioned earlier, the Fusion 325 is a higher-end RV with elegant furniture, appliances and look! The Master Bedroom is quite spacious and well-furnished as you would expect from what should be the relaxing “private corner”. 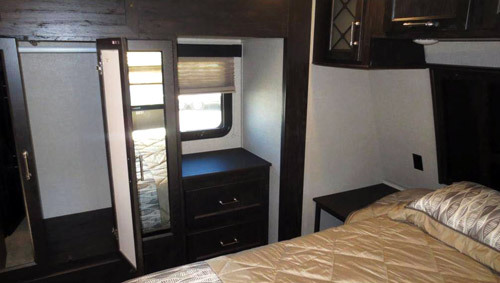 The walk-around queen-size bed (60” x 80”) with deluxe memory-foam mattress promises comfortable sleeping environment. The street-side slide-out houses wardrobe and dresser (the former is shared between the bedroom and the common passage across the bathroom). The wardrobe offers hanging rods for cloths and several shelves. The dresser (or rather Chest of Drawers) - as it name suggests offers “always in demand” drawers for folded cloths and even more precious worktop. It’s small, but thanks to the window above it is bright (at least during the day) and certainly will be greatly appreciated. Large overhead cabinets along the front wall and extra storage space in the corner Private Entertainment Center (below the TV screen) add substantial storage space. 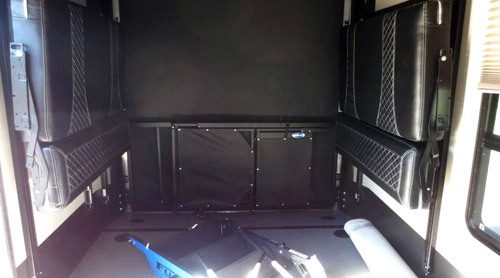 The under-bed storage is available as well, but understandably it will be rather used for all kind of stuff not needed on the daily basis (well, to be clear - the access is easy and effortless thanks to gas-struts). Two bedside nightstands with next to them 110V receptacles will be ideal for book(s), magazines, iPads, computers, charging phones and why not the cup of morning coffee….. You will also find individual reading lights above. What you may miss is (are) large panoramic window(s) bringing inside the natural light and with it the “outdoor world”. It’s true, that mirrored wardrobe makes the bedroom a bit lighter, but the surrounding nature (if any) will be mostly absent …. The bedroom’s floor is carpeted, what makes it “warmer” and softer, but also more difficult to keep clean. Then there is a door – fortunately a sliding one but also the only one (in other words there is no private entrance to the bathroom directly from the bedroom). 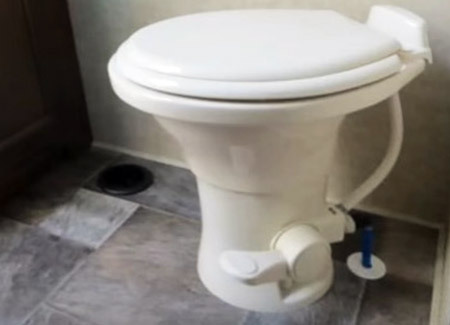 And that’s actually not that bad as one may think, because frankly, one bathroom in the large rig that can sleep up to 8 persons will never be private. As the result, it seems that there is no need for private door from the master bedroom. It’s a walk-in bathroom with enough of space to feel comfortably. The oversized shower cabin with sliding glass door has residential appearance. 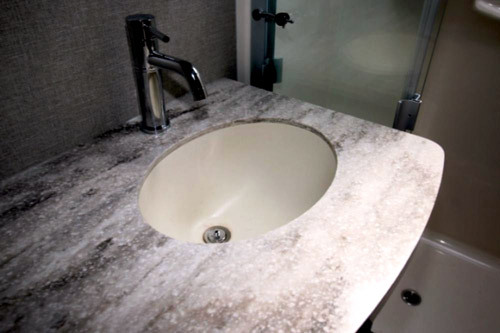 Large vanity with smoothly shaped countertop, integrated sink as well as hanging above medicine cabinet with mirrors adds more elegance. 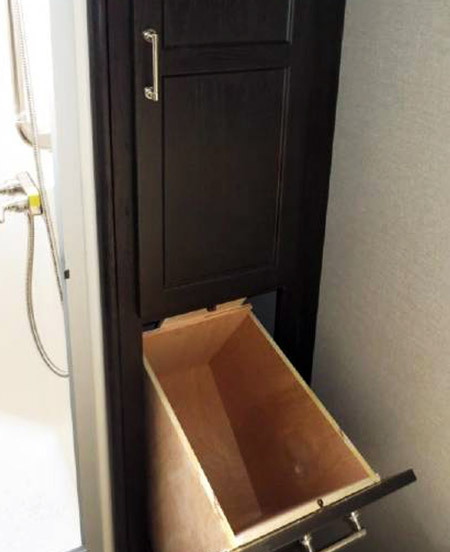 The linen cabinet with hamper brings practicality (convenient for towels and eventually dirty laundry, although the hamper seems to be too small to meet requirements…). The skylight above is maybe the only “unfamiliar” feature. 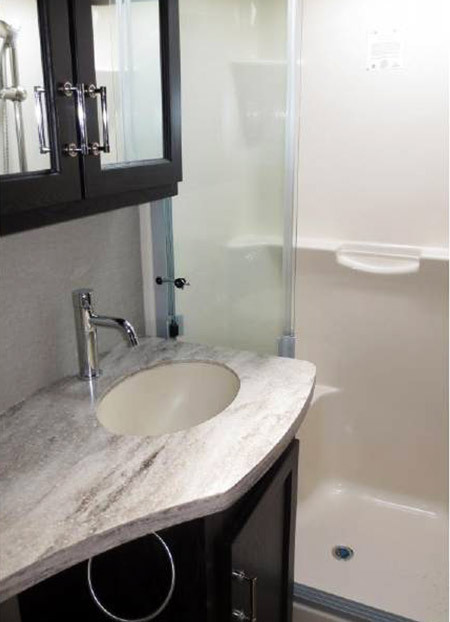 While typical in most RVs, it does not have much common with residential bathrooms, but here due to lack of window(s) its ability to bring daylight is priceless …. Plenty of storage space, shelves and drawers in kitchen’s cabinets (including overhead ones and the pantry), abundance of working space (solid-surface countertops, matching them sink covers and extension board together with huge fridge not only allow for preparation of elaborated meals, but also bring the “taste” of luxury…. The living room shares Fusion’s center section with the galley. The latter thanks to its L-shape is somehow “self-contained” but there is no clear separation “line” between the two. The sofa entirely takes the whole slide-out space. 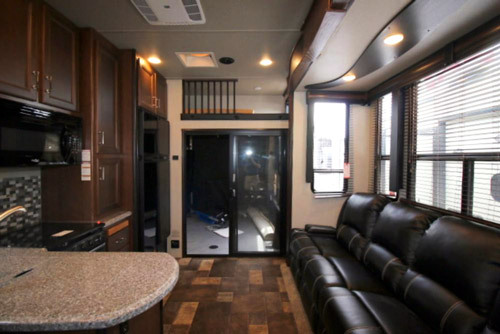 With large four sections, LED-lighted cup-holders and heated seats it is an ideal place to relax and enjoy reading, listening to the music or watching favorite TV programs. Indeed, the main Entertainment Center (ETC) is just across to the left. On the negative side – Fusion 325 deserves something better than the vinyl sofa (regardless how well it looks when new, its “residential” appearance will have limited time). Large LED TV screen, full spectrum of Audio (AM/FM/CD/DVD w/Bluetooth) and Sound-Bar functions promises “Home-Theater” quality entertainment. And if you want to make it more romantic and warm, the built-in ETC cabinetry fireplace is there to help. Unfortunately its location is a bit disappointing. As we know, the fireplace is not only the source of heat, it also adds charm, spreads feelings of “warmness” (in an emotional sense) but only if fully exposed to all of our senses including visual one. 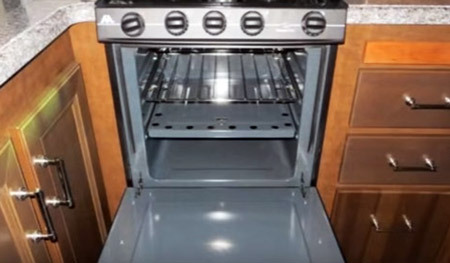 And here in Fusion 325 the fireplace is partially masked by the L-shaped kitchen sink cabinet…. 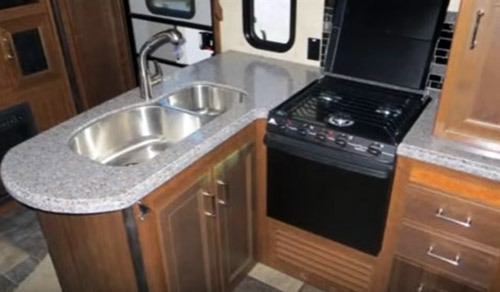 Looking at the floor-plan you probably realized that there is something missing in the central section of the Fusion 325 camper. And you are right – there is no Dinette Booth (or at least the table). 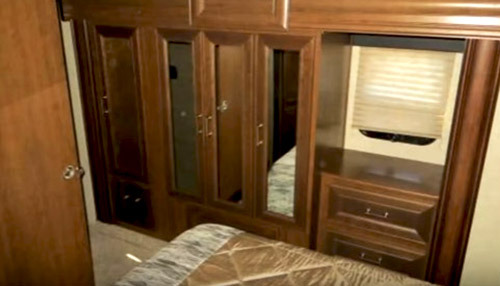 Well, that’s the “nature” of most toy haulers where the goal is to maximize the space for your toys. But do not worry, although Keystone does not offer any table as part of standard features, basically any folding table placed in front of the sofa will do the job. The full-height closet next to the entrance door represents what can be called “Triple-Right” feature (“right thing at the right place and right time”). Because what more you need when going out or coming in from outdoor activities than the space for jacket, jumper, personal stuff…. (and here the list can go on and on)? 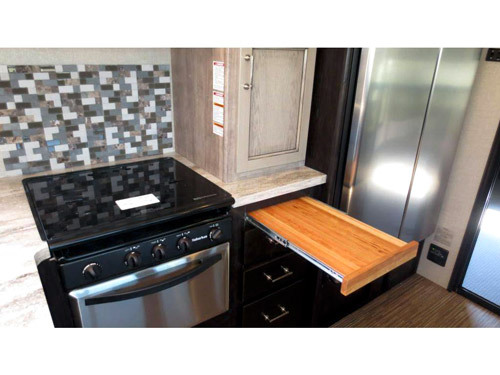 Well, right at the entrance you will find the handily accessible storage space…. Fusion 325: Section of the Kitchen/Living room (above the sliding-doors you can see the loft with protective barrier and mattress. 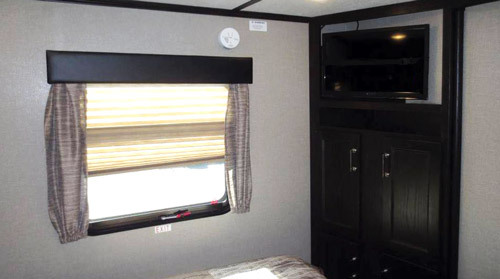 Cargo room in any toy hauler is designed as a “multipurpose” room, with focus being made on its ability to safely transport your bigger toys like ATV, motorbike(s)….. From this point of view the Focus 325 is not an exception. Indeed, with its length of 11 feet and 90” height (when sofas are rolled to the sidewalls) the cargo room can take a lot of stuff. The Black Diamond Plate wall protection and gas & oil resistant tuff-ply w/rubber cover flooring are designed to take possible “abuses”. The garage’s key feature is the 5K Inter-lock frame-welded tie-down system. Each tie can support 5,000 pounds of load, so your “babies” will be safe. Part of garage’s “infrastructure” is an easy to open (Keystone calls it “Zero-Gravity”) 8 feet long ramp door for loading and unloading…. 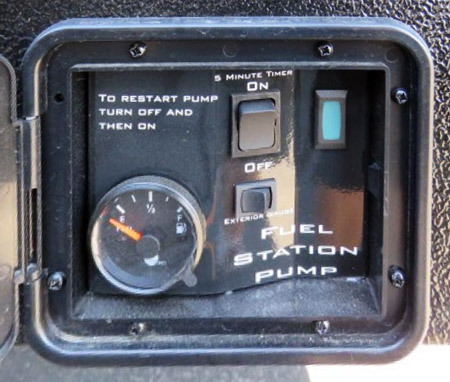 The 30 gallons fuel tank with pump and level gauge (accessible from the outside) is ready to feed your toys (and, do not forget – you have also an “on-board” 5.5kW generator). This pretty much completes the list of features making from the Cargo Room the garage. BTW - with sofas in upright position (suspended under the ceiling), the cargo room’s height will be limited to 79”, but in exchange you will re-gain the full width of the garage. At the front of the garage there is an attic with 40” x 80” mattress. 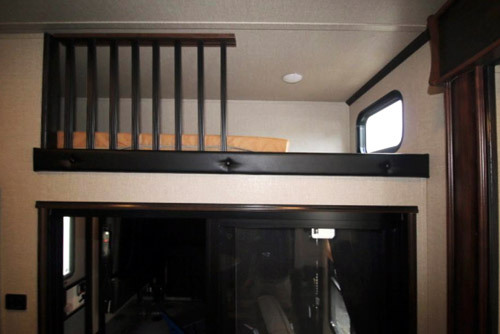 The portable ladder makes it accessible from the living room, while side window and wooden barrier make it safe and “habitable” as a sleeping place. The area under the attic is designed as a sort of utility room with all necessary hookups for washer/dryer and overhead cabinets. The garage also houses an extra storage space (so-called “Fusion Super-Storage”). However once all toys are out, the garage (thanks to double sliding glass doors) makes an extension of the living room. And then both side-sofas and portable table can be set-up to make from the garage a spacious, dining room. Large side windows (w/ night shades), eventually a piece of carpet over the floor will largely “soften” the ambiance while opened rear ramp-doors will bring-in the nature. And evenings, when the Mother Nature may lose some of her charm the 40” LED TV mounted on the pull-down swivel bracket is ready to take you into a “Different World”…. 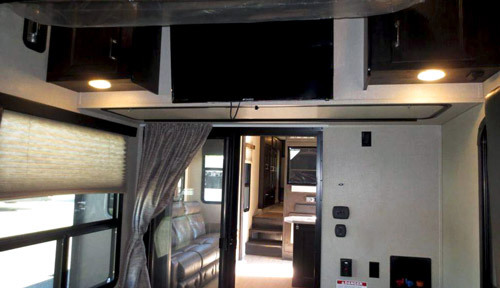 The cargo room is pre-wired for an optional roof-mounted A/C unit to extend the comfort beyond the sliding doors. The exterior pass-through storage will be handy for “bulky” camping gear. 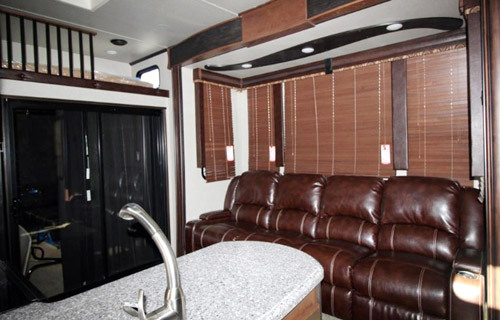 Unfortunately, like in almost all fifth wheels you will find few hanging pipes and wires obstructing the storage. 6-points hydraulic leveling system is very versatile. 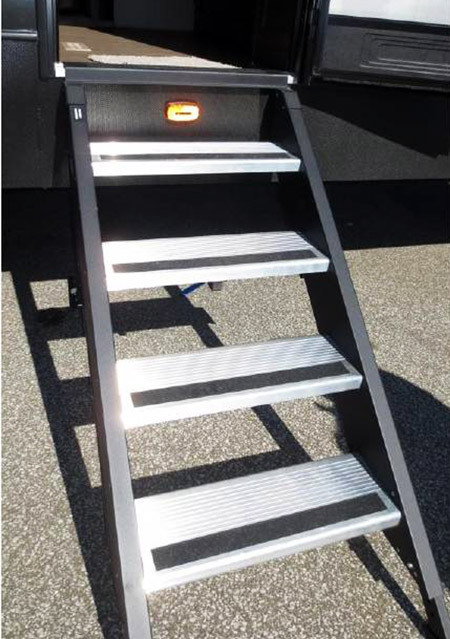 It can lift the trailer to change the tire, it levels the camper automatically and even remembers the last hitch position before unlocking from the truck. While it will not necessarily solve all of your problems when locking back with the truck, it will be at least easier to do. Command & Monitoring Center: traditionally it is a panel with tons of switches, monitor display and several LED lights indication status and eventually alarms. 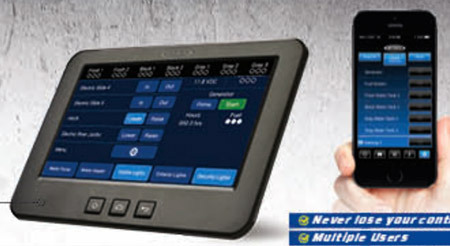 Keystone took advantage of modern technology introducing the touch-screen Display Commander and Monitor. At the touch of the screen you can control all power appliances and features (slide-outs, water pump and heater, awnings, generator, all lights and monitor all water and fuel tanks as well as auxiliary batteries… And the best is that you can download the free application to your cell-phone or iPad to use them as “local” command & monitoring units. 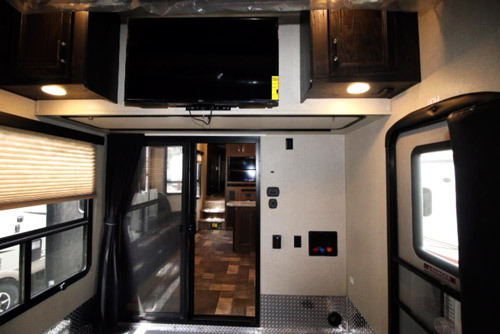 While the Fusion 325 toy hauler is not advertised as four-season camper, thanks to good body insulation, enclosed underbelly, heated tanks pads and climate control (A/C units and furnace) the camper can provide comfortable vacations over extended seasons. 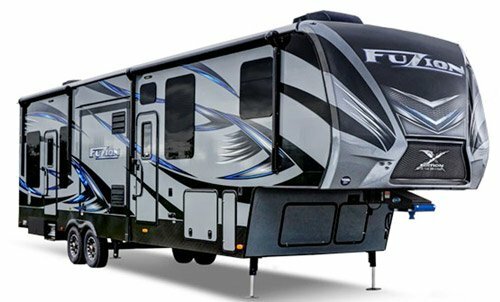 Note that the Fusion 325 Toy Hauler has two power awnings all-along the curb-side wall. In-Command Control System and an application ran on a cell-phone.